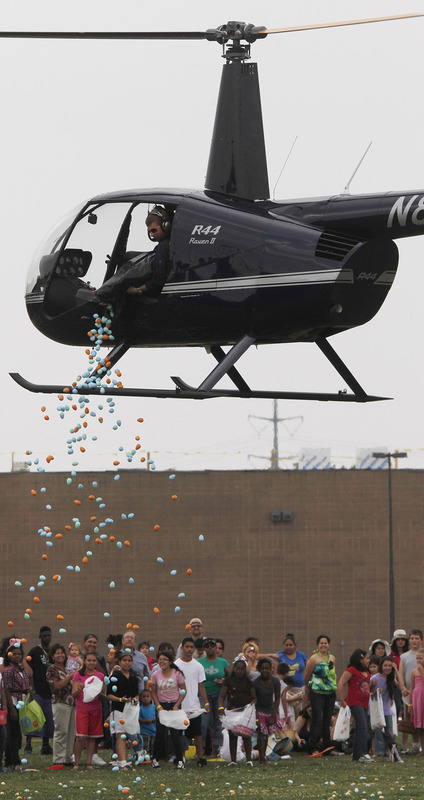 A large community church in Plano, TX (suburban Dallas) hired a helicopter to drop Easter Eggs in a stunt that crashed as church money burned. The failed Easter event left all Christians and churches looking idiotic in the eyes of people who think all Christians and churches fall a few thousand miles short of being legitimate. The fact that a church that is part of the (very imperfect) body of Christ (look up 1 Corinthians 12: 12-28) would spend church money and resources on such an expensive event in the first place is embarrassing to me and many others who are Christians. Tossing Easter eggs from a helicopter sounds like a nice, fun, family-friendly event, until news about it goes viral and your staff can’t control a 10,000-person crowd. LifePoint Church in Plano planned to drop Easter eggs Saturday from a helicopter into a field next to the church. “When we thought about a fun Easter event for the community, we thought tossing Easter eggs from a helicopter seemed like a good idea. We didn’t expect our event to go viral across blogs, event websites, Facebook,” the church said in a prepared statement Sunday. However, controlling the egg-loving crowd, which the church estimated at 10,000 people, proved too much, and no eggs were delivered. Such as, maybe having a traditional Easter Egg hunt and spending all that extra money on something like, say, needy kids to have Easter Baskets and maybe a meal as a bonus treat. Something more Christian-y like that actually does service to God and the have-nots among us–the needy folk that a church has a primary duty to provide for. Apparently this Plano church has money to burn, and burns it on stuff like helicopters for ludicrous stunts that in no way measure up to good stewardship of church money and resources. But according to the full story, this kind of spectacle was not the first of its kind. You can read the whole story here and see that such helicopter drops have been held by churches before. This one just happened to get out of control. Picture me with my head spinning like chopper rudders. Philosophy works out the cost of the bill for the meal called life. I’m not so sure that any and every old religion offers you an actual meal called life, but Christianity absolutely offers you the bread and wine of life. And nourishing fish as well. Our New and Old Testaments–from the Passover meal to the Eucharist and beyond–are shot-through with the language and symbols of sustenance from food and drink. 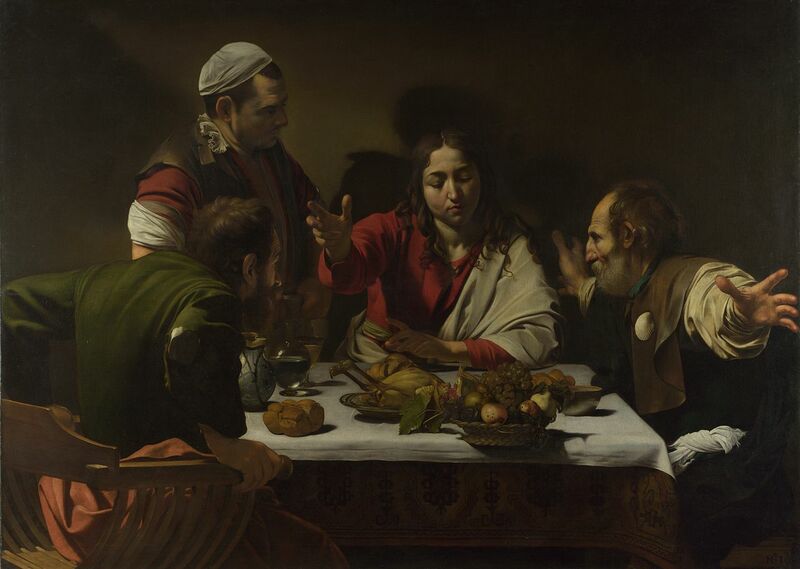 Page after page of The Word–especially our Christian gospels–reference some feast or banquet. The living Christ himself, for gosh sake, embodies the bread that gives new life and well being in mind, body and spirit to all who partake. One of my favorite quotes ever is from Aldous Huxley of “Brave New World” fame: “There is no such thing as Judgment Day. Every day is Judgment Day.” I believe that wholeheartedly. Jesus looks into our hearts and minds from the vantage point of the cross every day–that should humble us in our views of Judgment. Watercolor by Christian artist James Tissot (1836-1902). In all our conceit we think that we are somehow such good Jesus lovers that we are measuring up just fine to God’s standard of judgment, and will measure up when we take our last breath. It’s always someone else who’s going to be in trouble on a final, mythical Judgment Day. Think about who you think is going to pay when he or she meets the Maker. What makes you so surefire certain Jesus is going to flunk THAT sinner and give you an A-grade for the life you’re living? 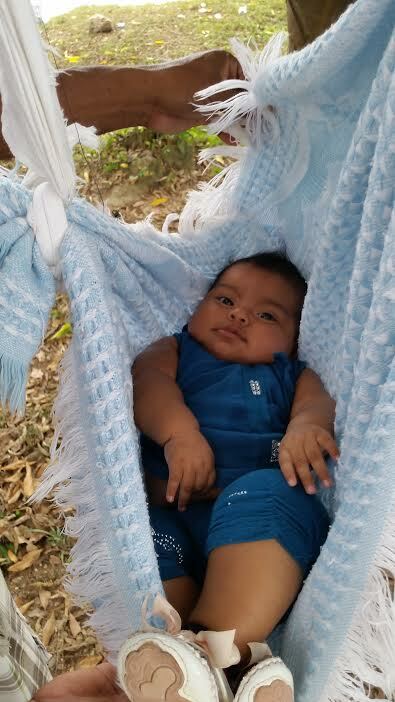 Really–nothing in this life or in the divine realm can be so certain, can it? The Good News of the Gospel is not a gloomy news editorial about who’s going to be in and who’s or going to burn forever and ever and ever in some literal lake of fire in Revelation, a book that was written almost entirely for the purpose of giving the suffering, persecuted Christians hope in the Lamb of God. It was written as the last word on the first word that was the Book of Genesis. When we say “Christ has died” we express the truth that all human suffering in all times and places has been suffered by the Son of God. There is no suffering — no guilt, shame, loneliness, hunger, oppression, or exploitation, no torture, imprisonment or murder, no violence or nuclear threat — that has not been suffered by God. There can be no human beings who are completely alone in their sufferings since God, in and through Jesus, has become Emmanuel, God with us. The Good News of the Gospel, therefore, is not that God came to take our suffering away, but that God wanted to become part of it. Have a good Good Friday. This was right before the awful Friday in which the world poured out its hatred on him–the day before God drenched the hate-filled world in his love. Peter was so freaked out that he wanted to wash the master’s feet, but the humble servant-leader who incarnated the most radical love even known wouldn’t have it. 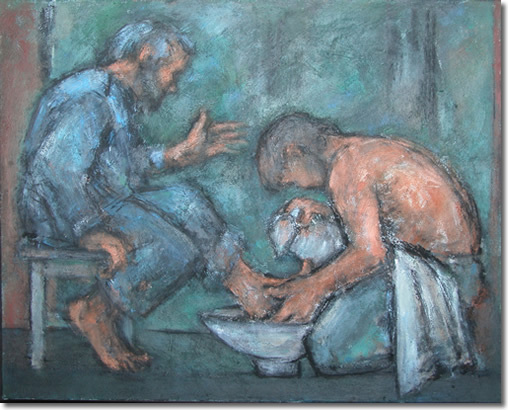 This foot-washing was to be the example for Peter and the boys–and all of us through the ages–to follow in their own servanthood. Jesus assured Peter that “later you will understand.” Indeed, it was days later, after the agonizing torture, death and resurrection of our Lord, that Peter and the surviving disciples finally understood. In this act of extravagant love and mercy, Jesus stooped down to wash even the feet of Judas, the man he knew would plant the kiss of death on him. This was the example he set for them, and, I repeat, for all of us for all times, in commanding us to forgive even the most extreme and seemingly unforgivable hatred of those who trespass against us. Nobody ever said forgiveness is easy. Nobody ever said forgiving–genuine forgiving– can be done in an instant. Forgiveness, more often than not, requires a lot of time and processing. In fact, in the most extreme cases of betrayals and sins and atrocities against us, we might have to ask God to do the forgiving for us. Beating yourself up with guilt for your inability to forgive someone is unhealthy and is not even based on healthy theology. 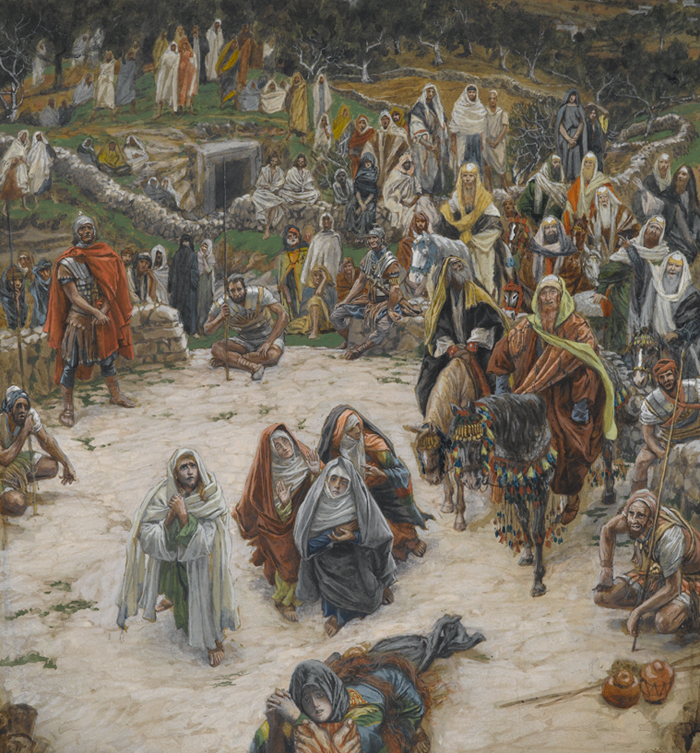 In grief and suffering, bitterness and rage against an enemy is an honest-to-God feeling and by no means a mortal sin against God who feels our pain. The Psalms are full of rage against enemies expressed to God to the point of rage against God himself for allowing so much anguish. If someone were to kill one of my loved ones, I doubt that I could forgive the killer that day, the next day, and maybe not for years. But asking God to do the forgiving for me would be an act of forgiveness in itself–if I were sincere in wanting the wrongdoer forgiven. Once some time in the most intense grief has passed, we must pray for the light and the power of forgiveness to dwell somewhere within our broken, wronged hearts. And one day we might just be able to let some grudge or even some intense hatred go and feel the sensation of the cleansing blood of forgiveness flowing in us. Once its genuinely achieved and the rage and bitter feelings have passed enough that we can live with still hurt feelings what once seemed impossible to forgive, forgiveness opens us to the liberating sensation of the blood of Jesus flowing unimpeded within us. But God knows it don’t come easy. Today is Holy Thursday and that’s what this this special day the Lord hath made is about. CHRIST washed the feet of Judas! And still in love he stooped and washed his feet. Aforehand knew and felt his treacherous kiss. Who in his Lord had basely sold his part. And though unasked, in spirit be forgiven. Christ washed the feet of Judas. At the Last Supper, Jesus gave the disciples a new commandment to love one another as he had loved them (John 13:34). Prior to breaking the bread with the disciples, Jesus washed their feet. Maundy Thursday worship services include Holy Communion and sometimes foot washing as well. 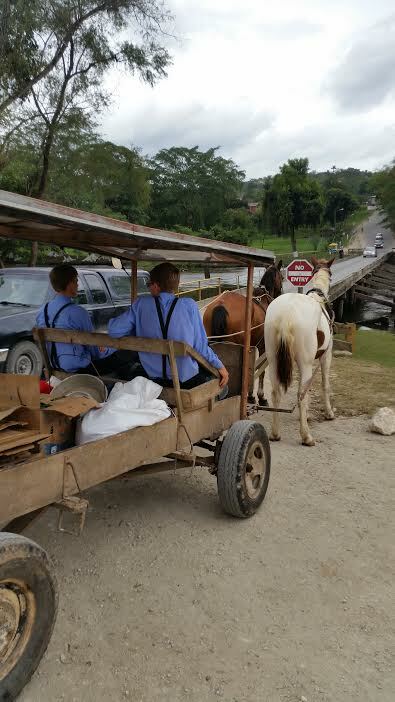 Picture here are two Mennonite lads parked at the no-entry side of the one-way, plank bridge over the Macal River that is the one and only bridge into San Ignacio and the rest of Western Belize. So why did the boys wait more than 10 minutes (I was sitting by the river and time it) to cross the one-way bridge the wrong way? 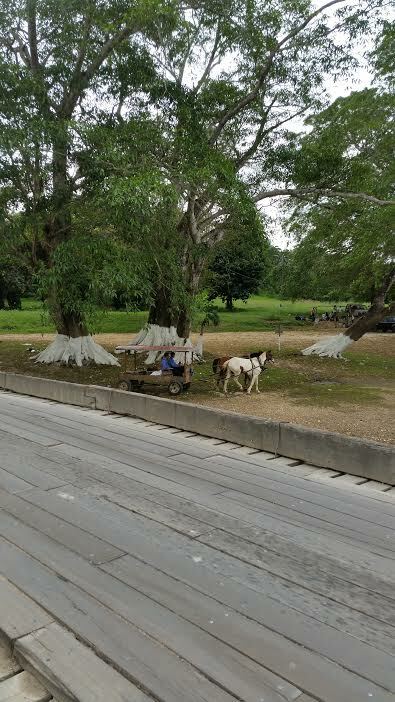 ANSWER: To get to the other side of the river where they could get out the bucket and get their horses drinks of water. And don’t ask why they couldn’t have done the same thing on the side of the river where they waited for 10 minutes because I do not know the answer. 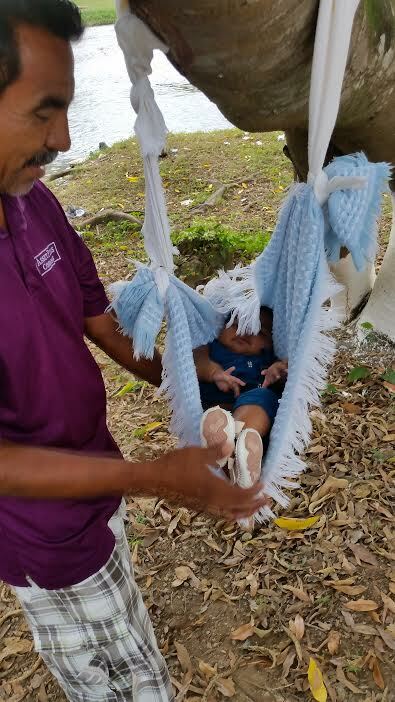 Also seen at the riverside today: a proud papa with his roly poly little fat face boy. Tuesday, March 22, Holy (Faith & Hope) Week, 2016 . . .
Another day, another tragic act of hate, this time in Belgium, where scores are dead and injured. A huge number of those injured will die or be maimed for life. The media’s casualty numbers always fall short. Hundreds of shaken witnesses to the chaos will suffer psychologically for the rest of their lives. One act of lethal violence–be it one murder in Dallas or a massive assault in Belgium–has ripple effects that inflict suffering most of us will never be able to imagine. The suffering goes on and on long after it’s been reported and left for history. With the world’s human condition being what it is, maybe it’s all hopeless. It sure feels like it on days like today. It seems so many days now as if terrorism is sure to prevail–if it hasn’t already. Every morning, day after day, we wake up in edgy anxiety, checking the news to see if the world has exploded. What we want to know primarily in our personalized fear, of course, is if the violent blowback from each episode of terror is headed in our direction today. We naturally worry about our own security most. Cowardly attacks by misguided evildoers who have hijacked the great world religion that is Islam shake our sense of faith and hope every time. We’re left reeling with doubt. 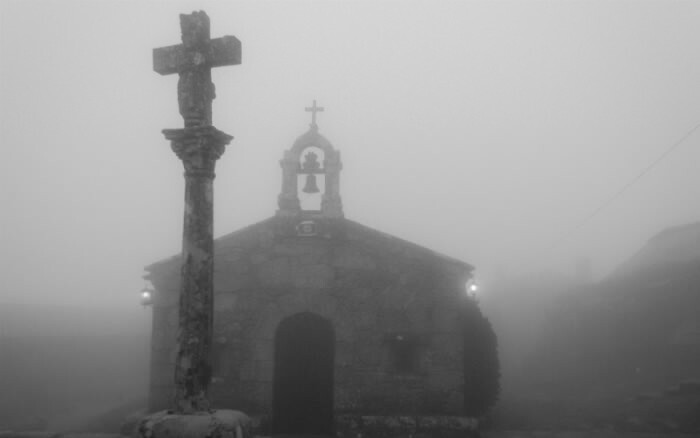 Our clear faith gets covered in fog. 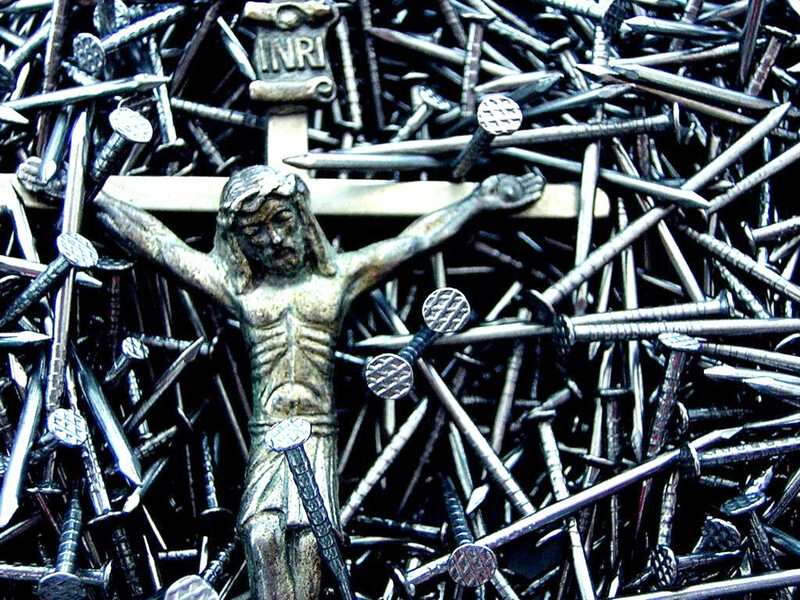 But every year in every “Faith and Hope Week” I’m reminded that even Jesus had his fleeting moment of doubt in his agony on the cross as he cried out feeling forsaken by his God. People of faith live with a certain amount of healthy doubt. As I’ve pointed out many times, “true believers” who harbor no doubt about their God crash jets into towers and (as today) blow up people in airports. Just remember, the battle has already been won. In this Holy Faith & Hope Week, remember that the Resurrection Day is near. It’s a fascinating thing to watch Dr. Ben Carson, who rides a bizarre kind of leadership pony, follow happily in the horse tracks and rancid droppings of Donald Trump’s Great White Steed. His man crush on Trump–who Carson says he endorsed partly because Trump offered him a job in a Trump Administration (and Carson must desperately need a job)–troubles even the good doctor’s dear friend James Robison. 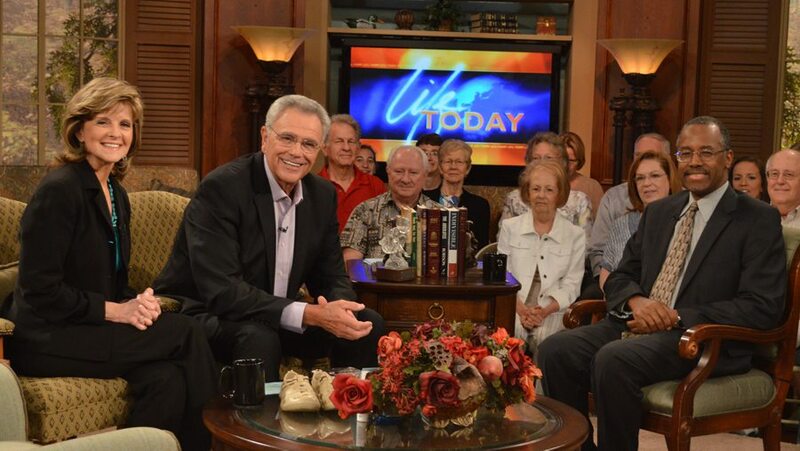 Happy Ben Carson with the “deeply troubled” TV evangelist James Robison (left, with wife Betty). Robison has been TV evangelizing out of Fort Worth going back to my college days near the Cowtown city. Considering that 95 percent of TV evangelists are shrill, glorified moneychangers who prey on the most vulnerable people for their profiteering and living in high cotton (as we in Texas describe the wealthy), the down-home Robison and his wife Betty stand out as comparatively humble, tolerant and reasonable. Mind you, my theology and New Testament ethics are diametrically opposed to that of Robison, and any other TV preaching huckster. But his theology at least includes some of God’s attributes that are missing entirely from some of his like-minded, fundamentalist brethren–beginning with the attributes of extravagant grace and tender mercies. That said, I want to share with you, dear readers, a TV interview Robison did with his friend Dr. Ben Carson. I think you’ll agree that Robison is baffled–really struggling to understand and come to grips biblically with Carson’s lame attempts to justify Trump. You will notice that many times throughout his conversation with Carson, Robison cites the behavior and language of Trump as “deeply troubling.” Carson fully acknowledges the concern, but promptly pivots to contend that Trump’s raging manner is OK in the big scheme of things. Shoot, it’s probably part of God’s plan, or so says Carson, who knows the mind of God in a way that most of us are not privy. Robison: The Bible is clear, “iron sharpens iron,” and that implies friction. I see this whole process as that friction, but it seems that when friction comes Mr. Trump’s way, rather than seeking the potential honing and sharpening effect, he tries to discredit, damage and in many ways destroy anyone who disagrees with him. That concerns me deeply. Carson: It is very concerning, and you notice that was not the tack that I took, but by the same token, the tack that I took was not successful and the tack that he took was successful for him. There is a pragmatism that goes with that. The fact of the matter is, we don’t know the end from the beginning. We think we do, but we don’t. What we have to do is go with it and trust. That’s where faith comes in. If things are not going the way we think they should go and we become disillusioned, we have to recognize that God has complete control. Frequently it’s always the darkest before dawn. First off, if somebody has any idea what “we don’t know the end from the beginning” means, please clue me in. Carson has a habit of babbling non-sequiters like somebody from a planet yet to be named. Now, from his answer to Robison’s concerns, Dr. Carson seems to think that the politics of personal annihilation is just “a pragmatic tack,” and that’s just how politics goes–and–golly gee–why should we expect higher standards from our leaders? We have to be realistic. He is right, theologically, that God is in control. But I’ve always noticed that this student of the bible Dr. Carson has missed that God’s control depends entirely on our obedience. I sense that Robison is troubled because instead of trusting in God and being obedient to God, it’s obvious to him and many of us that Trump thinks he IS God. There is no discernible smidgen of humility in Trump, and humility as a faith virtue goes back to Moses. This is Christianity 101. And yet it seems to me that Carson, who is famously humble to a fault, wants so much to hang on to Trump’s coattails–now that Trump is the “presumed nominee”–that he will say anything to get that job and elevate his stature in the Republican Party as part of his legacy of life achievement. Carson, who often said when he was a candidate that he was running because he wanted to “heal” the nation, has taken a strange tack to healing by embracing Trump. He is so lacking in his supposed dignity at this point that he will ride that bizarre pony of his behind his buddy Donald’s Great White Steed no matter how low Trump’s path to the White House goes. God only know how low that road will get when the Donald starts spewing his horse droppings all over Hillary Clinton. But give Carson credit. He knows how to charm the snakes out of the trees, and does, to elevate that aforementioned stature of his. That might be my political cynicism speaking and it might be God’s truth I’m speaking, and in my opinion, it’s the latter. You decide. Click here for the whole interview between these two ultra-conservative buddies.